Wowza... the new suit was slick, functional and definitely worth the wait! Aside from a few slower episodes toward the end, I've got little to complain about. Marvel's Daredevil not only exceeded my expectations, but it made me interested enough to pick up Frank Miller's "The Man Without Fear" comics run. 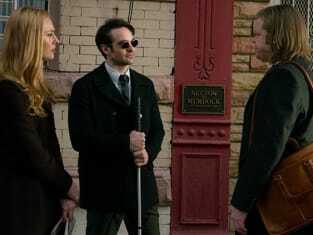 Though Daredevil Season 1 Episode 13 wasn't exactly full of surprises, it was a strong and emotional finale. Yes, Ben Urich's funeral made me cry. Not when Karen approached his widow mind you, but the moment the episode opened. I'm a big softy when it comes to powerful music and imagery. As I mentioned in my review of Daredevil Season 1 Episode 12, I'm still surprised Urich was taken out of play in the Marvel Cinematic Universe. His death, like Mrs. Cardenas', served a purpose though and strengthened our heroes resolve. The internet was a buzz blaming Karen for Ben's death. It was nice to hear his wife reassure her that he never got pushed into anything he didn't want to do. On the contrary, I think Karen re-energized his spirit and his love of journalism. Like Karen, I was a little annoyed that Foggy didn't attend the funeral. Okay, so he was working on the case to bring Fisk down, but still an appearance would have been nice. Karen was right to be afraid of Fisk. Though he never found out she was with Ben at his mother's nursing home, I wonder if he'll learn she killed Wesley in Season 2? Speaking of the Devil, Fisk did figure out Leland was stealing from him. Up until the end, I was impressed by how ballsy Leland was. The way he spoke to Fisk throughout the season was crazy. Can you believe he planned to walk away with half Fisk's assets? In the comics, Leland Owlsley becomes the supervillain The Owl. While he didn't seem to fall far down that elevator shaft, the guy looked pretty dead to me. I wonder if the son he mentioned takes on the alter-ego, seeking vengeance for his father? Or does that sound too Green Goblin-ish? Anyway, Leland mentioned he had crooked cop Hoffman stashed away. This gave Fisk one last loose end to take care of. I was glad Matt and Foggy finally put their issues aside. As I mentioned before, that relationship's crucial to this series. It would have been awful had they not reconciled. Permalink: No, we can't. But maybe we can find a way to move forward, Foggy. Though there was something about Marci I liked, I never imagined she'd grow a conscious and gather intel on Fisk and Owlsley. I'm totally #teamMarci now! I was thinking the same thing when Karen said, "It's the way it should be." That's right, the Nelson and Murdock trio hard at work to bring the bad guy down. It's kind of amazing how quickly I grew attached to these characters. That's a testament to the fantastic writing and this particular cast. Ultimately Hoffman was targeted by Fisk, but Daredevil saved the corrupt cop. Did you catch the Stan Lee cameo? When Hoffman turned himself in to officer Mahoney, that was Stan Lee in the photo in the background. With Hoffman's confession and Marci's paper trail, the Fisk takedown was under way. Permalink: It's funny, isn't it? How even the best of men can be deceived by their true nature. It wasn't surprising that Fisk managed to escape. I mean, there had not been a Daredevil/Kingpin face off yet. As I mentioned at the top, I thought the Daredevil suit looked amazing and the fight scene paid off as well. Both hero and villain took quite a beating. Both Charlie Cox and Vincent D'Onofrio were sensational on this series. As I mentioned before, I hope Marvel's Daredevil gets some kind of recognition come award season. Everyone involved nailed this one, it's quite an accomplishment. Things came full circle as Fisk stared at the texture on the wall. That “Rabbit In A Snowstorm” turned out to be really symbolic and I loved that little attention to detail. Vanessa survived and I'm sure she'll play a part in Fisk's eventual escape. Nelson and Murdock were back in business and all's well that ends well. 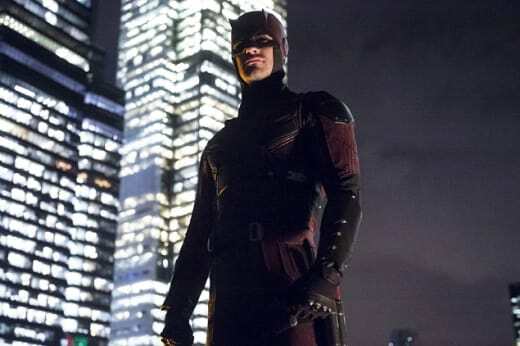 What did you think of “Daredevil”? Did you love the suit? Did you think Fisk would be taken down? Ready for Season 2? Your turn Daredevil fans, go ahead and hit the comments below. Share your thoughts on the finale and Season 1 overall.